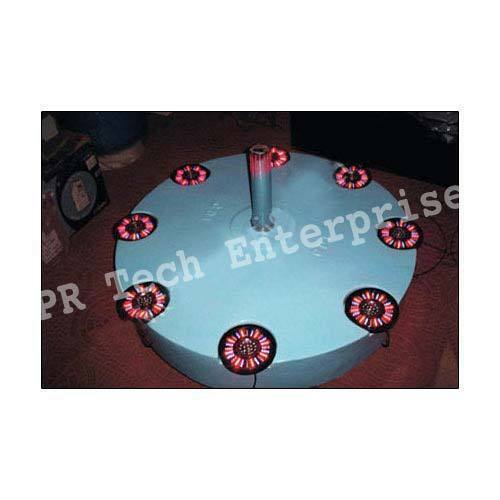 With the assistance of our customers, we are engaged in offering a wide array of Floating Fountains System. Formulated in the year 2010, APR Tech Enterprises is indulged in manufacturing an optimum quality range of Swimming Pools, Swimming Pools Accessories, and Fountains. The offered range is manufactured from high-grade factor inputs and advance technology highly in accordance with the set industrial standards and norms. Further, we quality test the entire manufactured range against various parameters in the quality testing laboratory before dispatching them. Our products truly reflect the creative talent of our craftsmen and attract the viewer's eyes with the first glance. Owing to these features, our offered range is widely appreciated and is installed in amusement parks, residential sectors, clubs, corporate buildings, shopping complex, gardens and various other places. Working with a motto of achieving utmost client satisfaction, we design the offered range strictly according to the minor details provided by the customers. Our ultra-modern infrastructure and qualified team of professionals have enabled us to complete the bulk orders with higher efficiency. These factors have played a key role in carving a niche for our products in the market and expanding the business globally. We offer this range in standard and customized variations at the industry leading prices. We are looking for Enquiries mainly from Delhi/NCR, Kolkata, Chennai, Bangalore, Hyderabad, Raipur, Bhopal, Patna, Lucknow, Allahabad, Goa, Mumbai, Ahmedabad, Bhubaneswar, Chandigarh, Shimla, Ludhiana, Jaipur, Udaipur, Srinagar, Noida, Greater Noida, Faridabad, Gurgaon, Ghaziabad and Meerut.